It seems like the “ache din” have finally arrived! After the long wait, the Aadhar based payments system was finally launched in the country today. Today is also a day of grave importance because the deadline to submit the final 1000 and 500 rupee notes have ended today. It is not a coincidence that after conducting several Digi Dhan Melas the government has finally decided to launch this app on this day. Since there has been a shortage of cash, the government has been pushing cashless transactions in the form of UPI payments. Finally the Bharat Interface for Money or BHIM has come into the market. BHIM is a rebranded version of the Unified Payments Interface (UPI). Nearly 21 banks have already started using this system to grant payments as of August, 2016. You can download BHIM from the Google PlayStore as it is available only on Android phones as of now. Soon it will be launched for the iOS too. UPI was a tad bit different. It came with a lot of features. 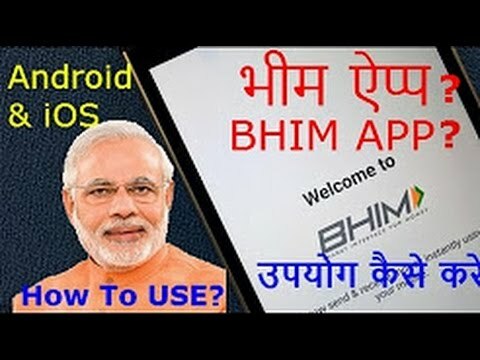 BHIM on the other hand has a simpler interface which everyone can use irrespective of their skill with gadgets. You don’t even need a lot of internal memory – the app comes with 2MB file size and gets downloaded within an instant with data connection. At present the app only supports Hindi and English but more languages will be launched very soon. You can scan QR code for faster payment as per this system. Upon downloading you will be asked to give your permission to send the OTP to your mobile number for verification. Once that is done, you can start making transactions smoothly through your chosen bank. If you have an account in more than one bank, then you will be able to easily switch between banks. On the home screen you will b shown some banks, choose your bank from the list, enter your PIN and check your balance. If you want to change your bank anytime, take a look at the three dots at the top right corner of the screen. Press it and change the bank. This system is built upon Immediate Payments Service (IMPS) which means that the transaction can take place within seconds. Yes, it takes place 24/7 too. You can transfer money as low as Rs. 1 and as high as Rs. 20,000 through this portal. However in a single transaction you cannot send more than Rs. 10,000. Modi dedicated this new app to B.R. Ambedkar saying that he was a great man and his contribution towards the upliftment of the condition of the poor was huge. Also, talking about the finger print scanner Modi has said that earlier people used to be ridiculed as “angootha chhap” now the same angootha or thumb will be used for making all transactions.